Badlands Motorcycle Products is proud to offer you the very best lighting control modules in the motorcycle industry! 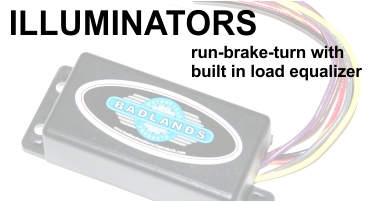 Started in 1990, Badlands Modules are the “originals” and our patented technology continues to be the BEST CHOICE with modules like the all-in-one RUN, BRAKE & TURN with Load Equalizer Modules, stand alone Load Equalizers, Self Canceling & Sequential Flashing Modules while boasting a LIFETIME WARRANTY! * LE-01 & LE-02 Load Equalizers DO NOT have a warranty and cannot be returned for any reason. * ALL other Badlands Modules are covered by an exclusive LIFETIME WARRANTY! * Customers MUST call our Sales Department and obtain an RMA before sending in a defective module.